Learn all about purcellin oil its uses and its benefits. Purcellin is a synthetic form of oil produced by ducks and other water fowl. Birds that need to stay afloat in water have uropygial glands located near the tail feathers. These glands make and store preening oil which the birds collect and distribute over their feathers. Natural soaps and lotions have long been made from duck oil. Bio-Oil is the first product to use a synthetic form of the substance. In 1972 Dieter Beier acquired Union Swiss, a South African distribution company for European personal care products. Following this acquisition he initiated an era of product development and began research into oil-based skincare in the mid ’70s, culminating in the development and launch of Bio‑Oil in 1987. One aspect that deserves special attention is the cost of Bio Oil, which runs at about $20 for over 4 ounces. At such a low price, this item is very affordable for most skin care budgets. Further, this low cost may be one of the reasons why Bio Oil reviews are generally positive. Purcellin’ is just a made-up trade name used for marketing, and the people that sell Bio Oil are rather coy about identifying which ingredient in their product it is. But a check of the patent literature shows that purcellin oil is listed as cetearyl octanoate (now known by its more recent name cetearyl ethylhexanoate) and a listed ingredient in Bio Oil. Far from being a unique and breakthrough product this is a very common synthetic emollient used in the formulation of a wide range of skin and hair care products. It is sold commercially in bulk to personal care product manufacturers under a number a trade names, including Crodamol CAP, Tegosoft Liquid and Luvitol EHO. And indeed the Bio Oil website makes no specific claim for Purcellin Oil other than it “changes the formulation’s overall consistency, making it light and non-greasy”. Younger scars have a greater chance of improvement within a shorter time period, however, older scars will also benefit from the regular use of Bio-Oil. On new scars, Bio-Oil should be applied only once the wound has healed, and should never be used on broken skin. You can apply Bio-Oil to aid the prevention of stretch marks or improve the appearance of existing stretch marks. Using your fingertips, simply massage Bio-Oil in to the skin twice a day. Bio-Oil helps to improve the appearance of uneven skin tones caused by hormonal fluctuations, skin-lighteners or excessive sun exposure. The signs for ageing skin are largely caused by the weakening of the collagen and elastin support system in the dermis. Bio-Oil contains age-fighting vitamins A and E that help to plasticize the skin, making it softer, smoother and suppler, thereby reducing the appearance of wrinkled and sagging skin. 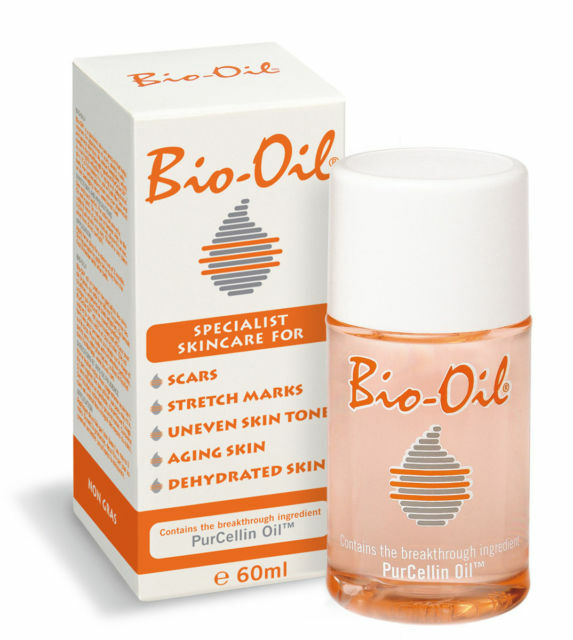 Bio-Oil helps replenish the skin’s natural oils so is a great product to apply after bathing. And yes, you can safely enjoy the goodness of this exceptional product on your face. Apply Bio-Oil after bathing, showering, sun-tanning or swimming. Massage gently into the skin, paying particular attention to dry or chapped areas. Bio Oil is also ideal as bath oil. The consumer Bio Oil reviews are largely positive, with many customers claiming that the product helped them achieve significant improvement in the appearance and texture of their skin. In addition to experiencing positive effects on the skin, many reviewers seemed to also enjoy the Bio Oil scent. Although scent may seem inconsequential for skin care, it’s actually a very important aspect, beyond just basic enjoyment. The reason that many consumers experience early onset of aging skin is because they don’t moisturize enough since they simply forget to do it or don’t feel that it’s important enough. However, research in the last few decades has suggested that a big part of our behavior is based on habits. A habit emerges when we have a cue, perform a routine, and receive a reward. Because Bio Oil smells nice, it can promote more regular skin care because the good smell acts as a reward for going through the process of applying this product. Therefore, in theory, the consumer is more likely to remember it and use it on a regular basis. Helps supplement the skin’s natural oils which can be stripped away by extreme weather, frequent bathing and the drying effects of central heating and air conditioning. Purcellin oil side effects connected to the ingredients of Bio Oil. Retinyl palmitate is connected with side effects like itching, burning sensation, scaling and redness. Also, the botanical extracts may cause skin irritation to certain people especially those who have very sensitive skin. It would be best to perform skin testing on a small area first before using Bio Oil to check for skin irritation or an allergic reaction. Although, Bio-Oil research indicates that controlled studies confirmed no side effects or skin reactions to this product when used as directed.